IWPS arrived in An Nabi Saleh at 11 am, one hour before the demonstration was scheduled to start. At 11:30am, two Israeli Military jeeps were stationed at the main road and a group of four soldiers were observed walking on foot through the village. Over a hundred gathered at An Nabi Saleh for their weekly demonstration against the occupation. The community of An Nabi Saleh was present with people from all ages alongside national, international activists and media. At 12 pm, following the afternoon prayer, there was a short speech that commenced the march through the centre of town down the main road. At the main road three Israeli Military Jeeps were stationed along with a large white “skunk-truck” equipped with a long range hose and a bulldozer apparatus in front. Chanting and singing, the crowd walked 300 meters past the gas station before pausing to set up defensive barricades with rocks. Two rock lines were set up before the Jeep and Skunk truck came forward removing the barricades, shooting several cans of tear gas and spraying the crowd with a sickeningly foul-smelling liquid. The crowd quickly dispersed and the truck and Jeep continued to drive the length of the village drenching each house and the street with the foul smelling liquid and tear gas as a form of collective punishment which is prohibited under international law. Furthermore, such attacks on private homes are unnecessary and dangerous to the families inside. Numerous people were soaked; many reported feeling ill from the overwhelming smell. By 2pm the jeeps and skunk-truck had parked at the surveillance-tower crossroads. 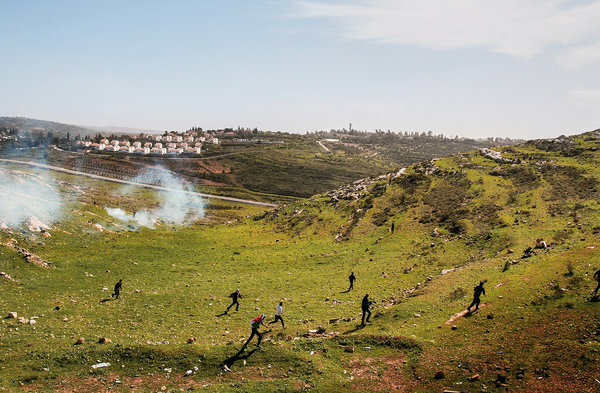 The demonstration had dispersed into small groups of 4 to 10 people being met by similar numbers of Israeli soldiers on foot, regularly shooting tear gas. New York Times article on Nabi Saleh: Is This Where the Third Intifada Will Start? 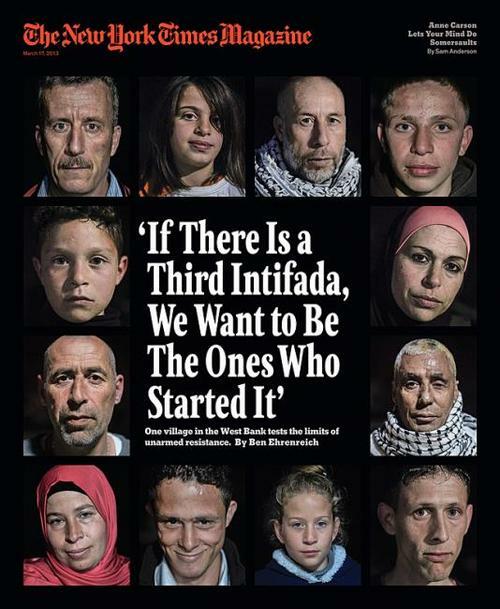 Cover of New York Times Magazine carrying the article by Ben Ehrenreich about Nabi Saleh. On the evening of Feb. 10, the living room of Bassem Tamimi’s house in the West Bank village of Nabi Saleh was filled with friends and relatives smoking and sipping coffee, waiting for Bassem to return from prison. His oldest son, Waed, 16, was curled on the couch with his 6-year-old brother, Salam, playing video games on the iPhone that the prime minister of Turkey had given their sister, Ahed. She had been flown to Istanbul to receive an award after photos of her shaking her fist at an armed Israeli soldier won her, at 11, a brief but startling international celebrity. Their brother Abu Yazan, who is 9, was on a tear in the yard, wrestling with an Israeli activist friend of Bassem’s. Nariman, the children’s mother, crouched in a side room, making the final preparations for her husband’s homecoming meal, laughing at the two photographers competing for shots from the narrow doorway as she spread onions onto oiled flatbreads. On the living-room wall was a “Free Bassem Tamimi” poster, left over from his last imprisonment for helping to organize the village’s weekly protests against the Israeli occupation, which he has done since 2009. He was gone for 13 months that time, then home for 5 before he was arrested again in October. A lot happened during this latest stint: another brief war in Gaza, a vote in the United Nations granting observer statehood to Palestine, the announcement of plans to build 3,400 homes for settlers, an election in Israel. Protests were spreading around the West Bank. That night, the call came at about 7:30. Twenty people squeezed into three small cars and headed to the village square. More neighbors and cousins arrived on foot. (All of Nabi Saleh’s 550 residents are related by blood or marriage, and nearly all share the surname Tamimi.) Then a dark Ford pulled slowly into the square, and everyone fell silent. Bassem, who is 45, stepped out of the car, straight-spined, his blue eyes glowing in the lamplight. He seemed a little thinner and grayer than the last time I saw him, in July. He hugged and kissed his eldest son. Ahed was next, then one by one, in silence, Bassem embraced family and friends, Palestinian activists from Ramallah and Jerusalem, Israeli leftists from Tel Aviv. When he had greeted everyone, he walked to the cemetery and stopped in front of the still-unmarked grave of his brother-in-law Rushdie, who was shot by Israeli soldiers in November while Bassem was in prison. He closed his eyes and said a quick prayer before moving on to the tomb of Mustafa Tamimi, who died after being hit in the face by a tear-gas canister in December 2011. Back at home, Bassem looked dazed. Nariman broke down in his arms and rushed outside to hide her tears. The village was still mourning Rushdie’s death, but the young men couldn’t keep up the solemnity for long. They started with little Hamoudi, the son of Bassem’s cousin, tossing him higher and higher in the air above the yard. They set him down and took turns tossing one another up into the night sky, laughing and shouting as if they never had anything to grieve. From most south-facing windows in Nabi Saleh, you can see the red roofs of Halamish, the Israeli settlement on the hilltop across the valley. It has been there since 1977, founded by members of the messianic nationalist group Gush Emunim, and growing steadily since on land that once belonged to residents of Nabi Saleh and another Palestinian village. Next to Halamish is an Israeli military base, and in the valley between Nabi Saleh and the settlement, across the highway and up a dirt path, a small freshwater spring, which Palestinians had long called Ein al-Kos, bubbles out of a low stone cliff. In the summer of 2008, although the land surrounding the spring has for generations belonged to the family of Bashir Tamimi, who is 57, the youth of Halamish began building the first of a series of low pools that collect its waters. Later they added a bench and an arbor for shade. (Years after, the settlers retroactively applied for a building permit, which Israeli authorities refused to issue, ruling that “the applicants did not prove their rights to the relevant land.” Recently, several of the structures have been removed.) When Palestinians came to tend to their crops in the fields beside it, the settlers, villagers said, threatened and threw stones at them. It took the people of Nabi Saleh more than a year to get themselves organized. In December 2009 they held their first march, protesting not just the loss of the spring but also the entire complex system of control — of permits, checkpoints, walls, prisons — through which Israel maintains its hold on the region. Nabi Saleh quickly became the most spirited of the dozen or so West Bank villages that hold weekly demonstrations against the Israeli occupation. Since the demonstrations began, more than 100 people in the village have been jailed. Nariman told me that by her count, as of February, clashes with the army have caused 432 injuries, more than half to minors. The momentum has been hard to maintain — the weeks go by, and nothing changes for the better — but still, despite the arrests, the injuries and the deaths, every Friday after the midday prayer, the villagers, joined at times by equal numbers of journalists and Israeli and foreign activists, try to march from the center of town to the spring, a distance of perhaps half a mile. And every Friday, Israeli soldiers stop them with some combination of tear gas, rubber-coated bullets, water-cannon blasts of a noxious liquid known as “skunk” and occasionally live fire. Last summer, I spent three weeks in Nabi Saleh, staying in Bassem and Nariman’s home. When I arrived in June, Bassem had just been released from prison. In March 2011, Israeli soldiers raided the house to arrest him. Among lesser charges, he had been accused in a military court of “incitement,” organizing “unauthorized processions” and soliciting the village youth to throw stones. (In 2010, 99.74 percent of the Palestinians tried in military courts were convicted.) The terms of Bassem’s release forbade him to take part in demonstrations, which are all effectively illegal under Israeli military law, so on the first Friday after I arrived, just after the midday call to prayer, he walked with me only as far as the square, where about 50 villagers had gathered in the shade of an old mulberry tree. They were joined by a handful of Palestinian activists from Ramallah and East Jerusalem, mainly young women; perhaps a dozen college-age European and American activists; a half-dozen Israelis, also mainly women — young anarchists in black boots and jeans, variously pierced. 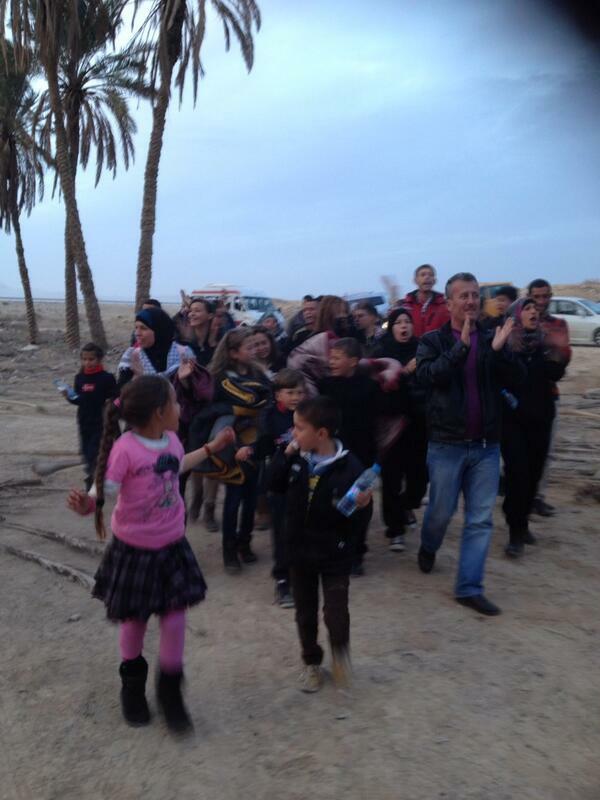 Together they headed down the road, clapping and chanting in Arabic and English. Bassem’s son Abu Yazan, licking a Popsicle, marched at the back of the crowd. Then there were the journalists, scurrying up hillsides in search of better vantage points. In the early days of the protests, the village teemed with reporters from across the globe, there to document the tiny village’s struggle against the occupation. “Sometimes they come and sometimes they don’t,” Mohammad Tamimi, who is 24 and coordinates the village’s social-media campaign, would tell me later. Events in the Middle East — the revolution in Egypt and civil war in Syria — and the unchanging routine of the weekly marches have made it that much harder to hold the world’s attention. That Friday there was just one Palestinian television crew and a few Israeli and European photographers, the regulars among them in steel helmets. In the protests’ first year, to make sure that the demonstrations — and the fate of Palestinians living under Israeli occupation — didn’t remain hidden behind the walls and fences that surround the West Bank, Mohammad began posting news to a blog and later a Facebook page (now approaching 4,000 followers) under the name Tamimi Press. Soon Tamimi Press morphed into a homegrown media team: Bilal Tamimi shooting video and uploading protest highlights to his YouTube channel; Helme taking photographs; and Mohammad e-mailing news releases to 500-odd reporters and activists. Manal, who is married to Bilal, supplements the effort with a steady outpouring of tweets (@screamingtamimi). Whatever success they have had in the press, the people of Nabi Saleh are intensely conscious of everything they have not achieved. The occupation, of course, persists. When I arrived in June, the demonstrators had not once made it to the spring. Usually they didn’t get much past the main road, where they would turn and find the soldiers waiting around the bend. That week though, they decided to cut straight down the hillside toward the spring. Bashir led the procession, waving a flag. As usual, Israeli Army jeeps were waiting below the spring. The four soldiers standing outside them looked confused — it seemed they hadn’t expected the protesters to make it so far. The villagers marched past them to the spring, where they surprised three settlers eating lunch in the shade, still wet from a dip in one of the pools. One wore only soggy briefs and a rifle slung over his chest. The kids raced past. The grown-ups filed in, chatting and smoking. More soldiers arrived in body armor, carrying rifles and grenade launchers. Waed and Abu Yazan kicked a soccer ball until a boy spotted a bright orange carp in one of the pools and Abu Yazan and others tried to catch it with their bare hands, splashing until the water went cloudy and the carp disappeared. The children piled onto the swing the settlers had built and swung furiously, singing. A young settler argued with the I.D.F. officer, insisting that he clear the protesters away. “What difference does 10 minutes make?” the officer said. “Every 10 seconds makes a difference,” the settler answered. But before their 10 minutes were up, one hour after they arrived, the villagers gathered the children and left as they had come, clapping and chanting, their defiance buoyed by joy. For the first time in two and a half years, they had made it to the spring. They headed back along the highway, which meant they would have to pass the road leading to Halamish. Ahed, her blond hair in a long braid, clutched a cousin at the front of the procession. As they approached the road, a border-police officer tossed a stun grenade — a device that makes a loud bang and a flash but theoretically, at least, causes no bodily harm — at Ahed’s feet, and then another, and another. Within a few seconds, the marchers were racing up the hill back toward their village, tear-gas grenades streaking through the sky above their heads. Bassem is employed by the Palestinian Authority’s Interior Ministry in a department charged with approving entrance visas for Palestinians living abroad. In practice, he said, P.A. officials “have no authority” — the real decisions are made in Israel and passed to the P.A. for rubber-stamping. Among other things, this meant that Bassem rarely had to report to his office in Ramallah, leaving his days free to care for his ailing mother — she died several weeks after I left the village last summer — and strategizing on the phone, meeting international visitors and talking to me over many cups of strong, unsweetened coffee. We would talk in the living room, over the hum of an Al Jazeera newscast. A framed image of Jerusalem’s Al Aqsa Mosque hung above the television (more out of nationalist pride than piety: Bassem’s outlook was thoroughly secular). Though many people in Nabi Saleh have been jailed, only Bassem was declared a “prisoner of conscience” by Amnesty International. Foreign diplomats attended his court hearings in 2011. Bassem’s charisma surely has something to do with the attention. A strange, radiant calm seemed to hover around him. He rarely smiled, and tended to drop weighty pronouncements (“Our destiny is to resist”) in ordinary speech, but I saw his reserve crumble whenever one of his children climbed into his lap. When Israeli forces occupied the West Bank in 1967, Bassem was 10 weeks old. His mother hid with him in a cave until the fighting ended. He remembers playing in the abandoned British police outpost that is now the center of the I.D.F. base next to Halamish, and accompanying the older kids who took their sheep to pasture on the hilltop where the settlement now stands. His mother went to the spring for water every day. The settlers arrived when he was 9. Halamish is now fully established and cozier than most gated communities in the United States. Behind the razor wire and chain-link perimeter fence, past the gate and the armed guard, there are playgrounds, a covered pool, a community center and amphitheater, a clinic, a library, a school and several synagogues. The roads are well paved and lined with flowers, the yards lush with lemon trees. Halamish now functions as a commuter suburb; many of the residents work in white-collar jobs in Tel Aviv or Modi’in. The settlement’s population has grown to more than double that of Nabi Saleh. I first met Shifra Blass, the spokeswoman for Halamish, in 2010. She talked about how empty the West Bank — she used the biblical name, Judea and Samaria — was when she and her husband emigrated from the U.S. in the early 1970s, intent on establishing a Jewish presence in a land they believed had been promised to them. Relations with the surrounding villages, she told me, had remained cordial, friendly even, until the first intifada. (When I asked people in Nabi Saleh about this, no one remembered it that way.) During the second intifada, three residents of the settlement, Blass said, were killed by gunfire on nearby roads. They weren’t near the village, but attitudes hardened. Bassem nonetheless speaks of those years, as many Palestinians his age do, with something like nostalgia. The first intifada broke out spontaneously — it started in Gaza with a car accident, when an Israeli tank transporter killed four Palestinian laborers. The uprising was, initially, an experience of solidarity on a national scale. Its primary weapons were the sort that transform weakness into strength: the stone, the barricade, the boycott, the strike. The Israeli response to the revolt — in 1988, Defense Minister Yitzhak Rabin reportedly authorized soldiers to break the limbs of unarmed demonstrators — began tilting international public opinion toward the Palestinian cause for the first time in decades. By the uprising’s third year, however, power had shifted to the P.L.O. hierarchy. The first Bush administration pushed Israel to negotiate, leading eventually to the 1993 Oslo Accord, which created the Palestinian Authority as an interim body pending a “final status” agreement. But little was resolved in Oslo. A second intifada erupted in 2000, at first mostly following the model set by the earlier uprising. Palestinians blocked roads and threw stones. The I.D.F. took over a house in Nabi Saleh. Children tossed snakes, scorpions and what Bassem euphemistically called “wastewater” through the windows. The soldiers withdrew. Then came the heavy wave of suicide bombings, which Bassem termed “the big mistake.” An overwhelming majority of Israeli casualties during the uprising occurred in about 100 suicide attacks, most against civilians. A bombing at one Tel Aviv disco in 2001 killed 21 teenagers. “Politically, we went backward,” Bassem said. Much of the international good will gained over the previous decade was squandered. Taking up arms wasn’t, for Bassem, a moral error so much as a strategic one. He and everyone else I spoke with in the village insisted they had the right to armed resistance; they just don’t think it works. Bassem could reel off a list of Nabi Saleh’s accomplishments. Of some — Nabi Saleh, he said, had more advanced degrees than any village — he was simply proud. Others — one of the first military actions after Oslo, the first woman to participate in a suicide attack — involved more complicated emotions. The losses of the second intifada were enormous. Nearly 5,000 Palestinians and more than 1,000 Israelis died. Israeli assassination campaigns and the I.D.F.’s siege of West Bank cities left the Palestinian leadership decimated and discouraged. By the end of 2005, Yasir Arafat was dead, Israel had pulled its troops and settlers out of Gaza and the Palestinian Authority president, Mahmoud Abbas, had reached a truce with Prime Minister Ariel Sharon. The uprising sputtered out. The economy was ruined, Gaza and the West Bank were more isolated from each other than ever, and Palestinians were divided, defeated and exhausted. We watched a clip of crying children being passed from a gas-filled room out a second-story window, down a human ladder to the street. Early on, the villagers took all the children to one house during demonstrations, but when the soldiers began firing gas grenades into homes, the villagers decided it was safer to let them join the protests. We watched footage of a soldier dragging a 9-year-old boy in the street, of another soldier striking Manal’s 70-year-old mother. Finally, Nariman shook her head and turned off the disc player. “Glee” was on. One Friday, shortly after the marchers had barricaded the road with boulders and burning tires in order to keep the army out of the village center, a white truck sped around the bend, a jet of liquid arcing from the water cannon mounted on its cab. Someone yelled, “Skunk!” and everyone bolted. Skunk water smells like many things, but mainly it smells like feces. Nariman wasn’t fast enough. A blast of skunk knocked her off her feet. Moments later, she was standing defiantly, letting the cannon soak her and waving a Palestinian flag at the truck’s grated windshield. An hour or so later, smelling of skunk and shampoo, she was serving tea to a dozen protesters. Every Friday was a little different. Some demonstrations were short and others almost endless. Some were comic, others not at all. Some days the I.D.F. entered the village, and others they stuck to the hills. Sometimes they made arrests. The basic structure, though, varied little week to week: a few minutes of marching, tear gas fired, then hours of the village youth — the shebab, they’re called — throwing stones while dodging tear-gas canisters and rubber-coated bullets until the sun set and everyone went home. Or failed to make it home. It was strange, asymmetric combat: a few dozen masked shebab ranging in age from 8 to 38, armed with slings and stones, against 20 or more soldiers in armored vehicles and on foot, dressed in helmets and body armor, toting radios and automatic weapons. The shebab put a great deal of thought into tactics, trying to flank and surprise the soldiers. But even when their plans were perfectly executed, they could not do much more than irritate their enemies. The soldiers, though, would inevitably respond with more sophisticated weaponry, which would motivate the shebab to gather more stones Friday after Friday despite — and because of — the fact that nothing ever seemed to change, for the better at least. “We see our stones as our message,” Bassem explained. The message they carried, he said, was “We don’t accept you.” While Bassem spoke admiringly of Mahatma Gandhi, he didn’t worry over whether stone-throwing counted as violence. The question annoyed him: Israel uses far greater and more lethal force on a regular basis, he pointed out, without being asked to clarify its attitude toward violence. If the loincloth functioned as the sign of Gandhi’s resistance, of India’s nakedness in front of British colonial might, Bassem said, “Our sign is the stone.” The weekly clashes with the I.D.F. were hence in part symbolic. The stones were not just flinty yellow rocks, but symbols of defiance, of a refusal to submit to occupation, regardless of the odds. The army’s weapons bore messages of their own: of economic and technological power, of international support. More than one resident of Nabi Saleh reminded me that the tear gas used there is made by a company based in Pennsylvania. One afternoon, I visited the family of Mustafa Tamimi, who was 28 when he died in December 2011 after being shot at close range with a tear-gas canister from the back of an Israeli Army jeep. (An I.D.F. investigation concluded, according to Buchman, that when the soldier fired the canister “his field of vision was obscured.”) The walls were covered with framed photos: an action shot of Mustafa in profile, his face behind a red Spider-Man mask as he slung a stone at soldiers outside the frame. In the weeks before her son’s death, Ekhlas, his mother, told me that soldiers had twice come to the house looking for him. When she got a call that Friday asking her to bring Mustafa’s ID to the watchtower, she thought he’d been arrested, “like all the other times.” Beside me, Bahaa, a tall young man who was Mustafa’s best friend, scrolled through photos on a laptop, switching back and forth between a shot of Mustafa falling to the ground a few feet behind an I.D.F. jeep, and another, taken moments later, of his crushed and bloody face. “This is the worst time for us,” Bassem confided to me last summer. He meant not just that the villagers have less to show for their sacrifices each week, but that things felt grim outside the village too. Everyone I spoke with who was old enough to remember agreed that conditions for Palestinians are far worse now than they were before the first intifada. The checkpoints, the raids, the permit system, add up to more daily humiliation than Palestinians have ever faced. The number of Israeli settlers living in the West Bank has more than tripled since the Oslo Accords. Assaults on Palestinians by settlers are so common that they rarely made the news. 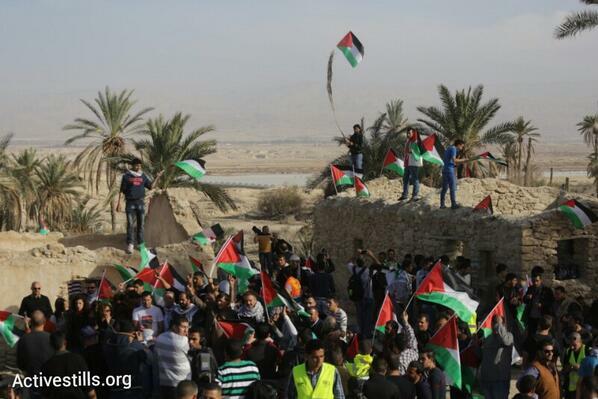 The resistance, though, remained limited to a few scattered villages like Nabi Saleh and a small urban youth movement. I sat down one afternoon in Ramallah with Samir Shehadeh, a former literature professor from Nabi Saleh who was one of the intellectual architects of the first intifada and whom I met several times at Bassem’s house. I reminded him of the car accident that ignited the first uprising and asked what kind of spark it would take to mobilize Palestinians to fight again. “The situation is 1,000 times worse,” he said. “There are thousands of possible sparks,” and still nothing has happened. In the 1980s, youth organizers like Bassem focused on volunteer work: helping farmers in the fields, educating their children. They built trust and established the social networks that would later allow the resistance to coordinate its actions without waiting for orders from above. Those networks no longer exist. Instead there’s the Palestinian Authority. Immediately after the first Oslo Accord in 1993, the scholar Edward Said predicted that “the P.L.O. will . . . become Israel’s enforcer.” Oslo gave birth to a phantom state, an extensive but largely impotent administrative apparatus, with Israel remaining in effective control of the Palestine Authority’s finances, its borders, its water resources — of every major and many minor aspects of Palestinian life. More gallingly to many, Oslo, in Said’s words, gave “official Palestinian consent to continued occupation,” creating a local elite whose privilege depends on the perpetuation of the status quo. That elite lives comfortably within the so-called “Ramallah bubble”: the bright and relatively carefree world of cafes, NGO salaries and imported goods that characterize life in the West Bank’s provisional capital. During the day, the clothing shops and fast-food franchises are filled. New high-rises are going up everywhere. “I didn’t lose my sister and my cousin and part of my life,” Bassem said, “for the sons of the ministers” to drive expensive cars. Worse than any corruption, though, was the apparent normalcy. Settlements are visible on the neighboring hilltops, but there are no checkpoints inside Ramallah. The I.D.F. only occasionally enters the city, and usually only at night. Few Palestinians still work inside Israel, and not many can scrape a living from the fields. For the thousands of waiters, clerks, engineers, warehouse workers, mechanics and bureaucrats who spend their days in the city and return to their villages every evening, Ramallah — which has a full-time population of less than 100,000 — holds out the possibility of forgetting the occupation and pursuing a career, saving up for a car, sending the children to college. Bassem saw no easy way to break the torpor and ignite a more widespread popular resistance. “They have the power,” he said of the P.A., “more than the Israelis, to stop us.” The Palestinian Authority employs 160,000 Palestinians, which means it controls the livelihoods of about a quarter of West Bank households. One night I asked Bassem and Bilal, who works for the Ministry of Public Health, how many people in Nabi Saleh depend on P.A. salaries. It took them a few minutes to add up the names. “Let’s say two-thirds of the village,” Bilal concluded. Last summer, my final Friday in Nabi Saleh was supposed to be a short day. One of the shebab was getting engaged to a girl from a neighboring village, and everyone planned to attend the betrothal ceremony. The demonstration would end at 3. Four armored cars waited at the bend in the road, the skunk truck idling behind them. Manal pointed to the civilian policemen accompanying the soldiers. “There is a new policy that they can arrest internationals,” she explained. Earlier that month, as part of the effort to combat what Israelis call the “internationalization” of the conflict, the defense forces issued an order authorizing Israeli immigration police to arrest foreigners in the West Bank. About half the marchers headed down the hillside. Soldiers waiting below arrested four Israelis and detained Bashir, the owner of the land around the spring. Everyone cheered as Mohammad raced uphill, outrunning the soldiers. (Three months later they would catch up to him in a night raid on his father’s house. He was imprisoned until late December.) I saw Nariman standing in the road with a Scottish woman. I walked over. Two soldiers grabbed the Scottish protester. Two more took me by the arms, pulled me to a jeep and shoved me in. I showed my press card to the driver. His expression didn’t change. Two frightened young women, both British, were already locked inside. After almost an hour, the soldiers brought a Swede and an Italian who had been hiding in the convenience-store bathroom. More soldiers piled in. I showed one my press card and asked if he understood that I was a journalist. He nodded. Finally, the driver pulled onto the road. As we passed the gas station, the shebab ran after us. They drove us to the old British police station in the I.D.F. base in Halamish. While I was sitting on a bench, an I.D.F. spokesman called my cellphone to inform me that no journalists with press cards had been detained in Nabi Saleh. I disagreed. (The next day, according to Agence France-Presse, the I.D.F. denied I had been arrested.) A half-hour later, an officer escorted me to the gate. As I walked back to Nabi Saleh, the road was empty, but the air was still peppery with tear gas. I made it back in time for the engagement party and flew home the next day. The five activists detained with me were deported. Two nights after I left, soldiers raided Bassem’s house. The following week, they raided the village five days in a row. On the day of Waed’s arrest, a camera caught Ahed shaking her fist, demanding that soldiers tell her where they were taking her brother. The Internet took over: video of the tiny, bare-armed blond girl facing down a soldier went viral. She and Nariman were invited to Istanbul, where, to their surprise, Nariman said, they were greeted at the airport by dozens of children wearing T-shirts printed with Ahed’s photo. They drove past billboards displaying Ahed’s image. Reporters followed them everywhere. Crowds gathered when they walked in the streets. They were taken to Prime Minister Recep Tayyip Erdogan in the southeastern city of Urfa, Nariman said, and flew back with him to Istanbul on his plane. In mid-November, Israeli rockets began falling on Gaza. Protests spread throughout the West Bank. “We thought it was the start of the third intifada,” Manal told me. 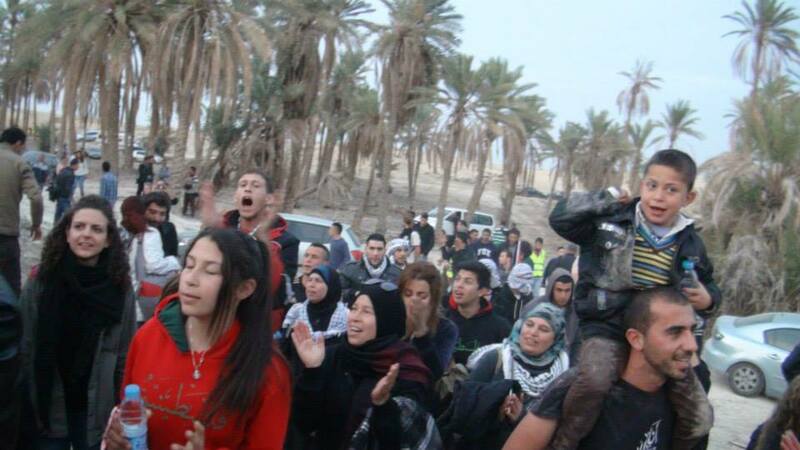 The demonstrations in Nabi Saleh stretched beyond their usual Friday-evening terminus. One Saturday in November, Nariman’s brother Rushdie — who worked as a policeman near Ramallah and was rarely home on Fridays — joined the shebab on the hill. He was standing beside Waed when he was hit by a rubber-coated bullet. Then the soldiers began shooting live ammunition, but Rushdie was hurt and couldn’t run. As he lay on the ground, a soldier shot him in the back from a few meters away. Nariman ran to the hillside with her video camera and found her brother lying wounded. “I wanted to attack the soldier and die with Rushdie right there, but I knew I had to be stronger than that,” Nariman said. “Why is it required of me to be more humane than they are?” Rushdie, who was 31, died two days later. An I.D.F. investigation found that soldiers fired 80 shots of live ammunition and neglected to “control the fire.” The unit’s commander was reportedly relieved of his command. When the fighting stopped in Gaza, the protests in the West Bank ceased. I went back to Nabi Saleh in January, three weeks before Bassem was expected home. The village seemed listless and depressed, as if everyone were convinced of the futility of continuing. On my first Friday back, the demonstration ended early: the shebab had a soccer match in another village. It rained the next week, and everyone went home after an hour. “We are still living the shock of Rushdie’s killing,” Mohammad told me. Elsewhere in the West Bank, though, momentum was building. In late November, Netanyahu announced plans to build 3,400 settlement units in an area known as E1, effectively cutting off Jerusalem from the West Bank. Just before I arrived in January, popular-resistance activists tried something new, erecting a tent “village” called Bab al-Shams in E1, symbolically appropriating the methods of land confiscation employed by settlers. “The time has come now to change the rules of the game,” the organizers wrote in a news release, “for us to establish facts on the ground — our own land.” The numbers were relatively small — about 250 people took part, including Nariman and a few others from Nabi Saleh — and, on direct orders from Netanyahu, soldiers evicted everyone two days later, but the movement was once again making headlines around the globe. Copycat encampments went up all over the West Bank — some in areas where the popular resistance had not previously been active. The day after his release, Bassem told me that even sitting in prison he had felt “a sense of joy” when he learned about Bab al-Shams. The popular resistance was finally spreading beyond the village demonstrations. “We have to create a sense of renewal,” he said, “not only in Nabi Saleh but on a larger scale.” The village’s losses — and his own — he acknowledged, were daunting. “The price is now higher,” he said, but “if we don’t continue, it would mean that the occupation has succeeded.” It would take constant creativity, he said, to hold onto the momentum. He didn’t know what it would look like yet, but just talking about it seemed to add inches to his height. Within days, thousands of Palestinians would protest around the West Bank, first in solidarity with prisoners on hunger strikes to demand an end to the indefinite detention of Palestinians without trial, later in outrage at the death of a 30-year-old prisoner named Arafat Jaradat. Once again, the words “third intifada” were buzzing through the press. Avi Dichter, the head of Israeli domestic security during the second intifada and the current minister of Home Front Defense, cautioned in a radio interview that an “incorrect response by the security forces” might push the protests into full-out revolt. On the last Friday I was there, the wind was against the demonstrators. Nearly every grenade the soldiers fired, regardless of how far away it landed, blew a cloud of gas up the road right at them. A dozen or so villagers watched the clashes from the relative safety of the hillside. Bassem’s cousin Naji was sitting on a couch cushion. Mahmoud, Bassem’s nephew, poured coffee into clear plastic cups. Bright red poppies dotted the hill between the rocks. The way was clear, but no one tried to walk down to the spring. When the demonstration seemed over, I trekked back to the village with a young Israeli in a black “Anarchy Is for Lovers” T-shirt. He told me about his childhood on a kibbutz bordering the Gaza Strip. His parents were “right-wing Zionists,” he said, “hard-core.” They didn’t talk to him anymore. A group of soldiers appeared behind us, and we ducked into Nariman’s yard as they tossed a few stun grenades over the wall. Later that evening, at Naji’s house, I watched Bilal’s video of the same soldiers as they strolled down the drive, lobbing tear-gas grenades until they reached their jeeps. They piled in and closed the armored doors. One door opened a crack. A hand emerged. It tossed one last grenade toward the camera. Gas streamed out, the door closed and the jeep sped off down the road. Ben Ehrenreich won a 2011 National Magazine Award in feature writing. His most recent novel is “Ether,” published by City Lights Books.